Like the name suggests, a pedestal sump pump sits on a pedestal that is designed to keep the pump out of water. This means they don’t share the same advantage as submersible pumps of using water as a coolant. Instead they use air. They are often used in buildings where the sump pit is too narrow or shallow to fit a sump pump. Pedestal sump pumps are sleek and don’t require a lot of space since most of the parts are above water. Normally, the pedestal sump pump comes in 2 parts- a hose and a standalone motor. The motor is installed above the basement floor while the hose connects the motor to the sump pit. Compared to the submersible sump pumps, pedestal pumps are easy to access and tend to last longer. Since the motor is not constantly under water, it does not face the threat of water damage. On the downside they are not as powerful as submersible sump pumps. They are not powerful enough to take on a storm but if it is small amounts of rainfall, then the pedestal sump pump should be good enough. Designed by Flotec, the FPPM3600-01/09 has a cast iron base and is made of thermoplastic. It features a seamless design that includes a top screen inlet and a non-clogging impeller to prevent entry of flow blocking materials such as stones. With its 1/3 HP motor, it has a maximum output of 3480 gallons per hour or 2460 gallons for a 10-foot water head. The motor requires a 3.5 Amp power supply and has thermal sensor that protects it against overloads. If the motor gets hot the thermal sensor turns it off to prevent the circuitry from blowing out. It is ideal for fast flooding basements as it quick and efficient. For clearance it requires a 12-inch diameter which means it can be used in small spaces. The 3/5 Amp motor starts automatically and is halted by the automatic float switch. With this key feature you are totally covered in case you are asleep or not around your house. The combination of a non-clogging impeller and top screen inlet ensures that there is smooth flow of water. The 6-foot grounded cord allows flexibility to set it in a variety of locations in the basements. The combination of thermoplastic and cast iron construction is not as durable as the previous sump pumps. Since it is a small pedestal sump pump, it is not as effective in large sump areas. The Superior Pump 92301 is designed for use in average-size basements. It has enough power to also drain water from overflowing washers and laundry sinks. It has a maximum output of 50 gallons per minute which is quite impressive considering it has a 2.76 Amp motor. At 10 feet, the pump can discharge water at the rate of 2280 GPH- typical in residential areas. While at 15 feet, its output drops to 2100 GPH. Both the impeller and the base are made of solid cast-iron to ensure high durability. The built-in impeller prevents clogging by rejecting any debris that are larger than 3/16 inch. It comes with a stainless steel float ball, stainless steel pump impeller, and a stainless steel shaft impeller. They are all corrosion resistant. The primary pump requires a 12” diameter for clearance. It has a 1.5-inch NPT outlet which is a standard size making it is easy to attach to the standard discharge plumbing. The pump can last twice as long as your typical submersible sump pump. Metallic float corrodes very easily and will require replacement within 2 years. 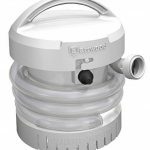 The EPC50 sump pump features a powerful 115V motor with the capacity to deliver 1/2 horsepower. The motor has built-in system that protects it from overheating making it ideal for use in heavy-duty operations. It has a maximum output of 5,000 GPH, which is more than enough for the average sized residential basement. With it built in impeller, the pump can filter debris larger than 3/8 inches. The pump has a zinc plated steel column attached to a cast-iron base. On top of that, the EPC50 has a smooth, quiet and fast operation. The pump is not only efficient but it is also energy effective. There are claims that it does not last for long. A good number of users have barely used it for more than a year and have already replaced it. 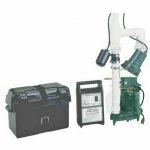 Offering impressive performance, the Zoeller 84-0001 is arguably one of the best pedestal sump pump as it reliable and has a powerful motor below the hood. It boasts of ½ horsepower which when compared to other models with 1/3 HP, the Zoeller is stronger. The motor is safely installed above the pit cover. This ensures that it is protected from water spray, high humidity and water. The pump is made of premium grade materials that are corrosion resistant and each component is not only made, but also assembled in the USA. Although the pump is very noisy, its performance and reliability is great. Some might see the noise as a good thing as they get to know the pump is still working even they are not in the flooded basement. The Zoeller 585-0005 is a premium pump that acts as a secondary sump pump. It provides support and backup just in case the primary pump fails. It comes in handy when a home owner travels during winter or rainy seasons. The pump comes with a battery-powered system that continues to function even after a power outage. The battery backup is very reliable and has a 12V motor connected to a contact flow switch. In addition, it has an automatic 28 Amp charger. With all the features Zoeller 585-0005 has, it is reliable, efficient and offers long lasting performance. Maximum output is 48 gallons per minute. Automatic battery charging this means that when the battery drains it recharges saving you the hassle. Does not require regular checkup as it automatically recharges. Since we’ve already provided you with a few options, how do you pick the right pedestal sump pump? Well, it’s pretty easy as long as you consider the factors below. Make sure you use them as a check list whenever you are shopping for a pedestal sump pump. If you intend to buy a pedestal sump pump, you must have use for it. How often do you think you will use it? Like most home tools and appliances, the service time of a pump is highly dependent on the frequency of use. The more you use it, the more it deteriorates. Therefore, if you anticipate to use it often invest in a pump that can handle the work load. Although the pumps are smaller than their submersible counterparts, it does not exempt them from the horsepower consideration. You want a pump with a high horsepower but the choice will be determined by your need. For pedestal sump pumps, the recommended horsepower is 1/3 or 1/2. Pedestal pumps are likely to be placed in tight spaces to free up room in the basement. Placing it in such a location means that it will be hard to operate. What do you do? Simple, buy a pump with an automatic float switch. A pump that allows you to set the water level at which the switch turns either on or off. The switch is adjustable meaning you can set the time interval between cycles. However, be careful not to stretch your motor too thin such that it wears out. The material used to make the pump will determine how long it will last. Materials such as cast iron are more durable and likely to last longer. Other materials such as thermoplastic are not as durable, but they are lightweight. Some prefer lighter pumps as they are easy to move around.However, if you look at the pedestal sump pump, you will notice that the weight is highly concentrated in parts that can handle heavy-duty applications. Nowadays, you can find affordable pumps made of hard form plastic but that does not eliminate the fact that it’s still plastic. For heavy-duty application, always go for cast iron and stainless steel. The two are better than plastic at preventing overheating especially during heavy-duty use. If you look at most pedestal sump pumps advertisements you will notice they tend to focus on the basic drain rate. It is important but there is more to pumps than just that. You probably have to pump water to higher ground to get rid of it. This means that the pump will have to work harder to get the water to your desired point. This reduces the drain rate significantly. Therefore, when shopping for a pump look at its drain rate at different heights. You have settled for 2 or 3 pumps that fit the factors you were looking for, what next? The price becomes the deciding factor. How much money are you willing to spend on a best sump pump? Do the pumps fit in your budget range? You don’t want to spend too little, buy a cheap pump that breaks down after a few weeks/months. You also don’t want to spend too much on a pump that you will only use once or twice a year. Weigh your options against your budget. Invest in a pump that will last you a lifetime of service with regular maintenance. Heavy-duty pedestal sump pumps are our favorite, they are constructed for heavy-duty application which is exactly what you will need when your basement floods. From the products we reviewed, it is easy to note that some are more efficient than others. Out of the five we reviewed our top pick would be the ECO-Flo EPC50 as it is superior in most aspects especially the drain rate. The Flotec FPPM3600-01/09 is another good pick as it has fairly powerful motor and an impressive drain rate. As for the Zoeller 84-0001, it also good but too noisy, too expensive, too heavy and difficult to install. It’s our hope that the guide will help make an informed choice.